At the request of Reagan's pediatric neurologist (her epileptologist didn't think one was necessary) we had a 23hr vEEG done. It was a long night, but Reagan was a real trouper, and other than when they put on and took off the leads, she was in a great mood the whole time! The results were then read by a different epileptologist who mentioned to her neurologist that it looked like a classic case of infantile spasms which would benefit from immediate ACTH treatment. 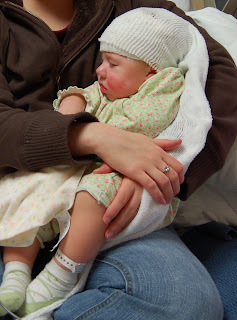 From what we could tell, the results from the vEEG were similar to her previous EEGs (with hypsarrythmia), but now we had several doctors in agreement that our next course of action should be ACTH treatment. We then contacted our epileptologist and he agreed. After stopping the Zonegran, we noticed that Reagan's seizures had increased in strength and frequency. We also noticed that in addition to the startle seizures she normally had (where she would push her arms out and throw her head back), she was also having ones where she would crunch forward. While most of these were individual ones, she did start having small clusters of them where she'd have 5 or so all in a row. So shortly after weaning completely off the Zonegran, Reagan started taking Keppra. She took a low dose for a week and we didn't see any changes, so they doubled the dose the following week. She was extremely irritable and we didn't see a decrease in her seizures, so we took her off of it and started Depakote (valproic acid). It never seemed to be doing anything for her seizures either even after doubling the dosage.